Commercial Real Estate and Business Attorney // Schenk Annes Tepper Campbell Ltd. I concentrate my practice in the areas of commercial real estate and business law. In my real estate practice, I handle acquisitions, dispositions, leasing, development, and zoning. I routinely work on matters involving shopping and retail centers, mixed-use developments, office buildings, and multi-family residential projects. In my business law practice, I counsel clients on business formations, corporate governance, and contractual matters and negotiations. I have been a proud member of the WBAI since I was in law school. I joined the WBAI because I feel passionate about promoting women’s interests and welfare in the law, and the caliber of WBAI’s opportunities for women are exceptional. As a WBAI member, I have had the opportunity to participate in skills-building presentations and volunteer with the WBAI’s Annual Dinner. I deeply appreciate the opportunity to learn from women further along in their career than me while also imparting what I have gained to those who follow me. To empower women, I think we need more women in power. Women are encouraged by seeing other women shatter glass ceilings and overcome barriers. Personally, I feel motivated and empowered when I encounter women advancing in their careers and filling leadership positions which were historically filled by men. Relatedly, I also believe it is crucial to have strong female mentors who can provide guidance to those younger attorneys in the legal field. 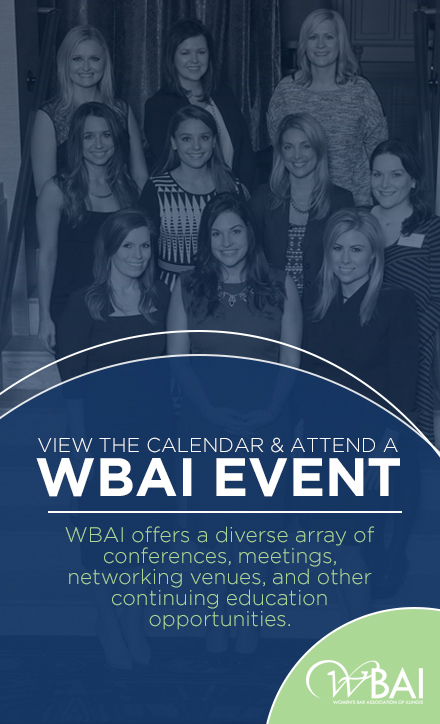 Joining an organization like the WBAI helps foster a collective network and forum for women to meet potential mentors and role models while also having an open dialogue about the many challenges and successes women encounter regularly in our careers and personal lives. What are you most looking forward to in the following year? I am most looking forward to getting married to my best friend in beautiful Hawaii next year. We have been dating for over ten years, and we are excited to finally tie the knot. I am a first generation Korean-American. My parents immigrated to the United States to give me the opportunities they never had, so I strive to embrace both sides of my upbringing. For example, I love kimchi jjigae, and I can also make a great Old Fashioned cocktail.